We talked to Piper's dad and learned that Piper just might like dock diving and from the sounds of things, could very well be a fellow disc dog too! Yay. So Bruce told Piper's dad about all the different fun places and things that might come with playing with a disc dog. 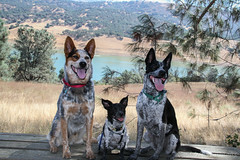 We told them about Doggone Dirty Dock Diving and what a fun place that is. 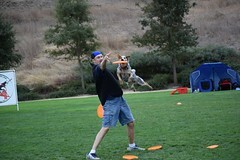 We told them about our disc dog club, Disc Dogs of the Golden Gate. 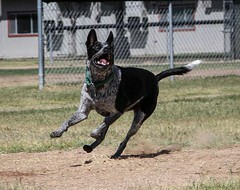 And we told him about places to get dog discs from, like Hero Disc USA. 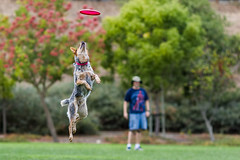 Dog discs are a softer type of disc with thinner lips so dogs can get their teeth around the edge. Discs: These are the more common kinds of discs fellow competitors use, (the following images are links to Hero Disc USA's Amazon offerings. 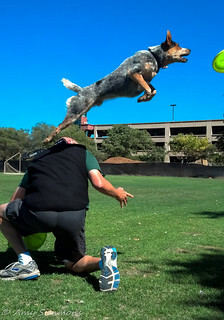 ), these discs are misprints of Hero Air 235s, the most commonly used disc in the world of disc dog competitions. 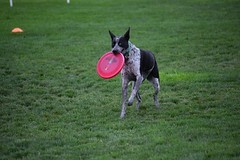 But if your dog is a heavy biter, like Vader, where he can destroy a disc in a week or so, we've found these Super Aero's survive Vader's power jaws much better and still fly almost as, if not better than (depending on the thrower) the other disc. The above discs are "blems" or "misprints," which are offered at a steep discount versus the perfect discs they sell. Also, when ordering blems, you don't a choice in color. You get what you get. 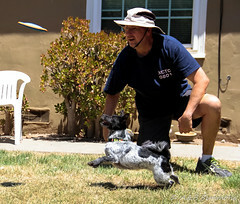 If you're curious about our journey to being Freestyling Disc Dog team, you can check out the featured article over on Bay Woof, that came out this month! 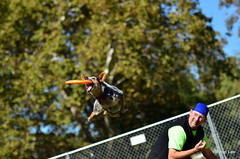 Here's pics from today's fun at Niles... it's always awesome to meet great people, dogs, oh, and turtles too.